It’s so prevalent that it is taken for granted – the need for management, for leadership. I believe the reason why people would need a boss… is because they had a boss. And having a boss dulls your ability to think for yourself, your initiative takes a hit and your creativity gets blunted. 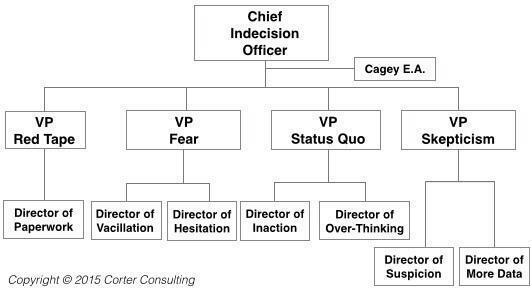 Management normally inspires indecision and dependence on management – simply because everyone wants to be valuable. A manager wants to be valuable as a manager. Hence he manages. And through that managing, he directs and motivates. And the people underneath him directs less and self-motivate less. A few days ago I attended a meeting where the boss insisted that “everyone needs a boss“. I disagreed of course, leading to a moment of confusion. I rocked a fixed idea. Such “obvious” foundations are seldom challenged and often simply accepted without any questioning. Your skills increase with practice, and your skills decrease with lack of practice. Having a boss that tells you what to do decreases your decision skills. Having a boss that motivates you decreases your self-motivation skills. And that is on a good day. It becomes even worse if you have a bad boss. But I would maintain that no boss is better than a good boss. Which is why my goal as a father is that when my children reach the age of 18, they would never again need a boss. OH GOOSH! I have been struggling with that. I have been micro-managed at food service at various schools for a long time. I told one of my bosses that there are lots of confusions between all those schools I go to work. I have been asking for a training book, but that one is only for food managers. Very suppressive! Now you have to be dependent to a boss. I have been so micro managed at times that I don’t think, just do piece by piece as you go. I know what it feels being a dog. Last week, I was put for the cooking, and the place is so busy that nobody had time to train you fully, except spitting words that doesn’t mean a lot. No TRs! I had to manage the best way I could. I wasn’t perfect, but I got practice to get experience, otherwise I have been stunted in my thinking not able to do 100%. Last Friday I burned 35 pizzas. The permanent food manager is out; shoulder surgery. Probably work injury. That old school requires 3 employees. We don’t have walk in refrigerator or freezer. We have to always find places to put things. Worse if over ordered of food. Last Tuesday, both the Sub Manager, and the permanent worker were both out. I believe they didn’t want to work the hard shifts, because the cook is not 100% processed; me, but I got better with practice. The timing you get it the same as one who works there for many years. The time is so micro managed, so it is very easy to miss the momentum because your are slower to start with, acquiring deep work experience . Also, all has to be done within a certain time. You won’t be able to get pay if you go overtime. Tuesday, third food manager and second worker, and I cooked. Wednesday, fourth food manager, and a third worker, and I cooked. Thursday fifth food manager, and fourth worker, and I cooked. I got much better, but stressful. Today Friday, I decided I didn’t want to work. I needed a day off. I also didn’t fell 100% well. I called in sick 5:45 am. I didn’t want to work because Friday was a harder day. I could see the disaster. I believe they are swimming. I was the most trained of us employees to manage elementary school over 400 breakfast and lunches. I hope the bosses realize that the place need more hours for the workers. All employees complain. In the morning we have to prepare and deliver breakfast. All has to be counted on paper. We deliver carts had leave baskets in class rooms. During lunch students are coming in big lines and the breaks between are short. Then you have to make sure you have enough food for the last students. Pre K and Kindergarten get special carts; food milk etc. for pick up for class room. Yesterday, I was OK with food, but short. Not enough lunches were delivered. We had add extra different lunches off the menu. Tuesday was a disaster, not enough. Those students had to eat pancakes. Students complained. We had food service organizers visiting our place. I told her that subbing is terrible, because they don’t do the same, always different, and that they are confusing from one place to another place. I also mentioned about the micro management. All the food service organizer did was to say that she agreed, and then she was giving misdirectors into something similar, but off subject. I had to bite my tongue, other wise we could have gotten into an argument, and we didn’t have time for that. She was causing Dev. T, in the wog world. I call it time stealing. I told her that she didn’t know where I was coming from, and that I was aware what is going on. It wasn’t worth for me to work today. I didn’t want to put up with all that confusion and time limits, and to be exhausted for the other part time job in the evening. It would be a disaster. Anyhow I would have lost even bigger momentum, because today this morning I did lots of various bronze statues in the bathroom with time spaces. When I do a 6 hour shift, I don’t have time to eat. That is my fasting time. I am very likely to go back and work there next Monday. I do it because in that confusion, I get the best experience. I be more my own boss. I hope there will be a change! Thank you for this e-mail! Gisela The trend seems to be that businesses increase micro management, and kill the individual creativity, which is a virtue. Next year I will not be a boss of my twin girls. August 17 they turn 18 years old. Yes. The way I see it, in my life, it’s only when I directed myself badly, that another was of help. When I forced myself towards things I didn’t want, or when I stopped myself from things I wanted, it’s nice to have somebody show it to me–sort of being directed to be my (good) director. But to be forced towards a direction, would be the complete opposite. And I work at night to be as independent as possible too. Since I know what to do there, I don’t need and it doesn’t help to be driven. And fortunately, most of the time, in my current job, as long as things go well, they rarely interfere. Yes – it’s good to have good guides at times. But to have a permanent boss in a hierarchical structure – now that’s taking it a bit too far. And it their effort to be cause, they didn’t want to be effect. We just didn’t talk. They talked. And operated with penalties, fear etc. I guess that’s called suppression. When I briefly worked in the COS, my senior was such a nice person. Then she was taken to the SO for a ‘cycle’. Our unit operated mostly with volunteers, and what did they teach her? How to use ‘wrath’. OMFG–as if anybody ought to do what she wanted. Good post, Geir. Yep, when we are ‘”Boss,” the viewpoint alters accordingly! The ‘boss’, (as we know), in turn, becomes sub-serviant to his customer, whose lead he is thus often obliged to follow! — Again for that all important pay cheque! In that respect, ( at some point,) even the “boss”, becomes the follower! I fully agree with you on this Geir, except on one part, of course. I have raised my girls to be as independent as possible, from cooking at age 4 to handling school dealings ( not an easy task for schools to deal with, to the extent of, I told a school I could not read, just so they could not remove the control for my girls I have already established). I noticed around 17 there is another shift in the way teens handle things, and have gotten frustrated with the reliance the girls have shown. I am pretty sure 17/18 is a critical age. I have read that brains are still developing until 25. I allowed the girls space and make decisions for now, and a year later, the decision making process of theirs seems to be making a comeback. “Organization, in nature, isn’t top down. Or even sideways. It’s a scene where everyone works and everyone contributes. From the lowest micro-organism to the largest grazers, as well as the carnivores, both large and small. It’s an interactive scene. There is no start or finish. There are times and days and life times. But those are just steps, sequential, ordered – but not driving anything. Days and time just are. Much as the beings which are there – are. Plants are. The Weather – storms and sunny days as well, these just are. “Yet everything wants to just give and get. It’s all exchange. And here’s the TED talk of another guy after your own heart, who learned from his experiences trying to help some natives in Africa. This principle is why I tend towards Libertarianism. Excellent posts recently Geir. I was just about to comment that no-one has mentioned “government”, but here’s aotc and Libertarianism. The Government is, after all, “The Boss Of All Bosses”….